So I'm kind of obsessed with face masks. Okay, that's an understatement. I AM EXTREMELY OBSESSED WITH FACE MASKS. (I think the all caps shows just how much I love them.) I buy a ton of them and I use them all the time. And I'm always looking for the next one to take my breath away. Recently, that's the Fresh Vitamin Nectar Vibrancy Boosting Face Mask. This mask sat in my Sephora cart for about two months before I finally purchased it. I kept going back to the site and looking at it, almost purchasing, and then stopping myself. Maybe it was the $62 price tag, maybe it was the fact that I already have about a million other face masks in my medicine cabinet. But finally, I just couldn't take the suspense anymore and went for it. The Fresh Vitamin Nectar Vibrancy Boosting Face Mask has a scent and consistency similar to that of orange marmalade. In other words, YUM. I mean, just LOOK AT THAT DELICIOUSNESS. I really wish you could smell this mask through the screen, because it smells delightfully like orange marmalade. The consistency is also similar to that of marmalade, with a interestingly bouncy texture. I have to admit I was a bit hesitant to rub it all over my face -- but my apprehension was put to rest when I saw it sinking in without any weird, crumbly mess left behind. I let this mask sit on my skin for 20 minutes before rinsing off with warm water. And let me preface that by saying my skin was in DESPERATE need of hydration and nourishment. After using this mask, though? All I can say is WOW. My skin was noticeably softer and smoother, with no dullness or dryness that had previously been there. My cheeks and forehead had been especially dry, but after using this mask they felt like the skin of a newborn baby! My skin was also much more vibrant and glowy than before. Fresh has long been one of my favorite skincare brands, and this mask just makes my love for all things Fresh even stronger. Dry skin is definitely a thing of the past! 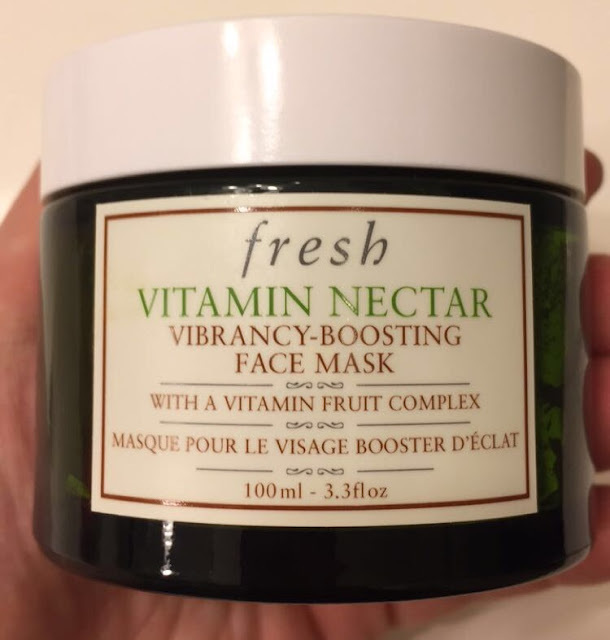 The Fresh Vitamin Nectar Vibrancy Boosting Face Mask retails for $62 at spear.com. pricey for sure, but you had me at real citrus ingredients! This sounds like my kind of mask! While pricey, it definitely looks delectable! This mask sounds great but that price tag will definitely keep me away from it. This sounds like a very nice mask! I know I'd love this but the price is awfully high. Nice and detailed review. I love to read your post. Pricy but sounds interesting. I'm always down for a citrus skincare product! Although that is definitely an investment. Gosh, that is definitely marmalade! I can imagine how delicious the smell must be! This sounds very interesting. I've never tried a face mask before and this one is a bit pricey. I would love to try this! I've yet to actually buy anything from Fresh, but the freebies and other stuff I've tried have been top-notch. This definitely looks like it was worth the money! I just read about this in a magazine... definitely a great citrus mask. I so want to try this! I have been loving their black tea perfecting mask.